Ethnically Armenian and born in Georgia director Sergei Paradjanov only made four films in a span of nearly 30 years, yet remains one of the most acclaimed Soviet directors of all time. 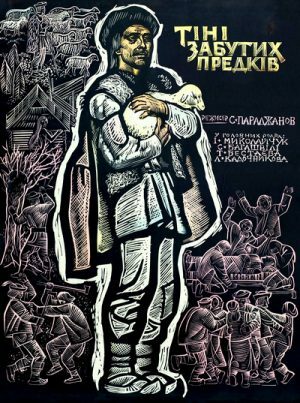 Based on Ukranian folklore, Shadows of Our Forgotten Ancestors — Paradjanov’s feature debut — is a rare film which demands repeat viewing in order to appreciate its relentless stream of colorful imagery; scene after scene is dazzling in its cinematic innovation. Known as the “Carpathian ‘Romeo and Juliet’,” Shadows transcends cultural boundaries with its universal trope of tragic romantic loss, yet simultaneously remains firmly grounded within the fascinating minutiae of Eastern European village life. Shadows of Our Forgotten Ancestors is set in Western Ukraine (Carpathian mountains) circa the 1860's. It spins a seemingly straightforward tale of two lovers, Ivan and Marichka, who develop a magical, passionate bond in childhood, but who are kept apart tragically in life, only to be reunited spiritually in death. The film also features a detailed portrayal of Ukrainian Hutsul culture, showing not only the harsh Carpathian environment and brutal family rivalries, but also the beauty of Hutsul traditions, music, costumes, and dialect. Fifty years later, Shadows remains both one of the most beautiful and revolutionary films ever made. • Photo album: "In memory of Sergey Paradzhanov: Film and Collage"
• Bonus trailers for "The Legend of the Surami Fortress", "Ashik Kerab", "Father of a Soldier", and "Repentence"
Can you re-up please? Thanks.